I have a big three ring binder full of all the recipes that I have clipped from Southern Living Magazines over the last few years. I love their recipes and I have found many recipes that I enjoy. Whenever I copy or tear out a recipe from one of their magazines I put it in this binder. I have tried many of these recipes. But I have many recipes left in my binder that I have not tried, so I occasionally try to look through my binder and find new things to try. This recipe was one that I recently found and tried. I am so glad I did. This soup was so good. The whole family enjoyed this soup. It was easy, healthy, and frugal. This soup is also perfect for a cold winter day. 1. Saute first 4 ingredients in hot oil in a large Dutch oven over medium-high heat 5 minutes. Add chicken broth, 1 3/4 cups water, and next 3 ingredients. Bring to a boil; reduce heat, and simmer, partially covered, 23 to 25 minutes or until vegetables are tender. 2. 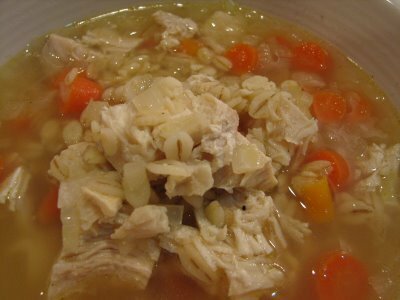 Add chicken and barley; cook 8 to 10 minutes or until barley is tender. I have not used Better Than Bullion. I have used chicken and beef bases. They are like a bullion but a paste. Is it like that? Yum! Barley has become a familyfavorite recently. I use it now in place of rice. I’m glad to find another recipe taht uses it! This looks really good. I’ve got all the ingredients and have printed off this recipe too.